The headlines will scream that Canadian fossil fuel use plateaus by 2019, according to the National Energy Board’s new energy outlook, but the real story is just how slowly consumption of natural gas and oil declines between now and 2040. The Energy Transition appears to be in no hurry to arrive in Canada. 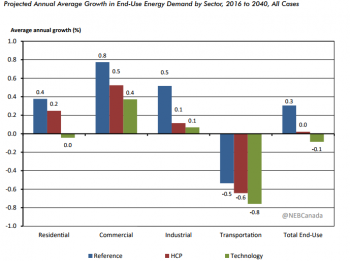 The dominant energy narrative these days is that fossil fuels are about to be displaced in a hurry by clean energy technologies like solar and wind, electric vehicles, and LED bulbs. Not so fast, says Canada’s national energy regulator. One of the key findings of the report is that the reference case, which includes a carbon price of $50/tonne, shows almost no decline in fossil fuel consumption at all by 2040. Keep in mind the forecast assumes coal power generation will be almost non-existent by the end of the forecast period. The higher carbon price case (national carbon tax rises to $140/tonne) is only eight per cent lower than in the reference case and 13 per cent lower in the technology case (greater use of a selection of emerging energy technologies, like electric vehicles and more efficient home appliances) by 2040. These are not startling changes. In fact, they underscore what energy scholars like Prof. Vaclav Smil have long argued: that energy systems change slowly, around three per cent a year. Matthew Hansen is an NEB analyst who worked on the forecast and he explains why Smil and other pundits (including this writer) argue that the Energy Transition will take a very long time. “Energy systems are complex and diverse, so changes in factors like energy efficiency can take time to work through the system. The share of emerging technology can increase rapidly, but when you start from a small base it can take a while to have a big impact,” Hansen wrote in response to emailed questions. Hansen points out, quite rightly, that the adoption rate for new technologies is always uncertain, particularly so in the early stages, and that the rate can be much slower or faster depending on a variety of factors, such as costs, consumer preferences, quality of services, and government policy. For instance, the Canadian and Alberta governments have committed to ending coal power generation by 2030 (in 2015, Canada produced 61.9 million tonnes of coal, most of it thermal). Not surprisingly, the NEB forecasts coal use to decline by 83 per cent to just 5.4 million tonnes in 2040, when all remaining coal plants will be equipped with carbon capture technology. Speaking of power generation, in 2040 the NEB thinks hydro will continue to supply just under 60 per cent of electricity. 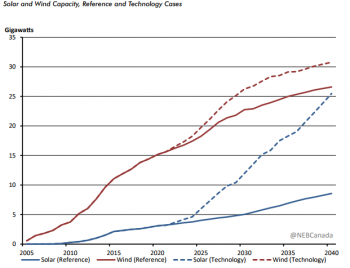 What is surprising is just how little impact wind (9.5% up from 4.4%) and solar (1.8% up from .6%) will have, despite an anticipated dramatic decline in solar capital costs. In fact, natural gas use for generating electricity almost doubles over the forecast period (from 9.7% to 17.5%). Another perhaps unexpected prediction given the public hysteria over electric vehicles is how slow EVs will be adopted in Canada. Only 11,500 EVs were sold in Canada last year, just 0.6% of all passenger vehicle sales. The NEB’s reference and high carbon price assume EVs will make up three per cent of vehicle sales in 2020 and 16 per cent in 2040; self-driving technology is not widely adopted and has little impact on adoption. The technology case, which assumes Quebec will continue to heavily subsidize EV purchases (the current subsidy is $8,000, higher than the US federal subsidy) is more aggressive, forecasting EVs make up six per cent of total sales in 2020, and 47 per cent in 2040. But even in the technology case, energy consumption (primarily oil) for transportation only declines an average of less than one per cent a year (0.5% in the reference case and 0.6% in the high carbon case). 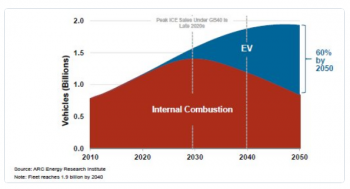 That forecast incorporates the planned more stringent vehicle fuel economy standards, which many observers think will have a greater impact on gasoline demand than electric vehicle adoption during the forecast period. “New for this report is the inclusion of the emission standards for heavy-duty vehicles. These are key elements behind reduced transportation and total fossil fuel projections,” says Hansen. Oil production, on the other hand, increases substantially, rising 59 per cent (4 million b/d in 2016) to 6.3 million million b/d by 2040 in the reference case. The high carbon case slows growth by nine per cent and production drops to 5.7 million b/d. Almost all of that increase comes from Alberta in situ bitumen production, with mining showing only a slight rise in output. In all cases, the NEB assumes global oil prices will be significantly higher than today (West Texas Intermediate has been hovering around $50/b for months), ranging from $65/b to $80/b. Natural gas prices are similarly forecast to rise, from a low of $2 MMBtu (million British thermal units) last year to $4.30 in 2040, driven by increased demand for power generation and liquified natural gas exports to Asia, whose energy consumption is expected to rise 37 per cent from now until 2040. The future of natural gas production in Western Canada has been the subject of debate, thanks to the rise of cheap American shale gas, which is challenging Canadian producers in traditional Midwest and Eastern Canadian markets. The Canadian Association of Petroleum Producers fears Canadian output could fall 50 per cent by 2030. 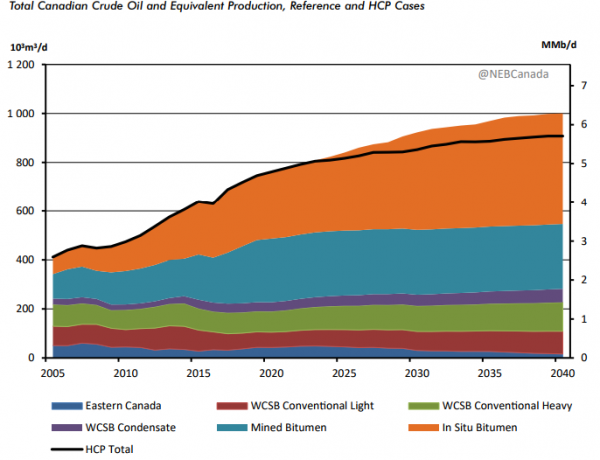 But the NEB is more optimistic, forecasting rapidly growing production after 2022, reaching a high of about 12.5 billion cubic feet (Bcf) a day in 2040 from the current 10 Bcf/d. All in all, Canada’s Energy Future 2017: Energy Supply and Demand Projections to 2040 shows a Canadian energy system in the early stages of adopting the new energy technologies, which have only a minor impact on national energy consumption patterns and actually help to increase oil and gas production in Western Canada.